Hello and happy Thursday! I made this for today's Ways To Use It Challenge on SCS to use fabric on your card. I decided to use a scap of material instead of dp : ) I adhered the fabric with some glue, then added a straight stitch to secure it to the Very Vanilla panel. 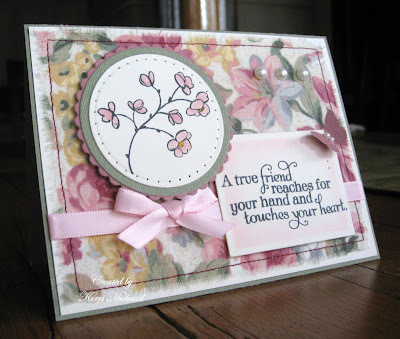 The floral stamp is from SU Embrace Life and the sentiment is from Verve Hundred Hearts. I added some piercing and punched a butterfly with a Martha Stewart punch. I added the pearls and ribbon and it was complete! I'll have to think of fabric more often while making cards! Thanks for stopping by today! Oh that's so pretty, Kerri! I love fabric on a card - it just makes it so much more....heartfelt and handcrafted. So soft and pretty this one is! Just gorgeous!! Thanks for sharing!! Hey, why didn't you tell me you got another design assignment?????? Congratulations! Wow! The fabric looks great on this card!